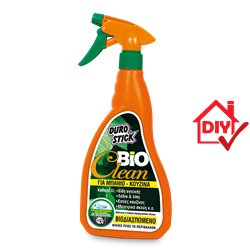 Biodegradable cleaner, free of allergens, ammonia, phosphates and petroleum derivatives. Human and environment friendly, per the european directive EC 648/2004. The specific directive governs the composition of detergents with respect to their biodegradability. It does not irritate hands and it does not cause any inhalation related problems during and after use. Product with superior cleaning action that does not affect sensitive surfaces. Just spray once and rinse to remove oils and grease, stains from sauce and difficult stains, blood, soot, salt stains and soap scum from bathroom fixtures and tiles. Use it to remove stains from grout and marble, polished or honed. Effectively cleans painted walls, stainless steel utensils, refrigerators and stoves etc. Necessary for every house but also hotels and restaurants, hospitals and recreation boats, bakeries etc.